Now that the Holy Doors are opened at the Cathedral as well at the other designated Shrines, we need to constantly catechize our people on the need to be aware that we are in the Great Jubilee Year of Mercy. Maximum use must be made of the grace-filled year to draw our people to a profound experience of God’s infinite mercy in their lives, as well as to “be merciful as our Heavenly Father as merciful”. As we have already reflected on the need to begin the conversion with ourselves as the shepherds of our flock, we need to make every endeavour to enter into the spirit of the Year of Mercy, with zeal and enthusiasm. I, therefore, urge all of you to make use of every possible opportunity to exhort our people to make many pilgrimages to the closest Shrines which have a Holy Door, and enter into the spirit of repentance and conversion, and obtain the treasure of indulgences, specially of a plenary indulgence, every time a baptised faithful enters the Holy Door with proper dispositions. In the months ahead, I shall, in my monthly newsletter write to you on different aspects of the Holy Year of Mercy. I also wish to take this opportunity to thank all of you for collaborating very closely with the committee appointed by me to coordinate the visit of Fr. Giuseppe Jasso, and the gathering of children, sponsored by him for their education. It was a fitting tribute to this wonderful man who at such an advanced age makes great sacrifices to find sponsors and continue to help so many poor children in their education. I would like to thank in particular, Fr. 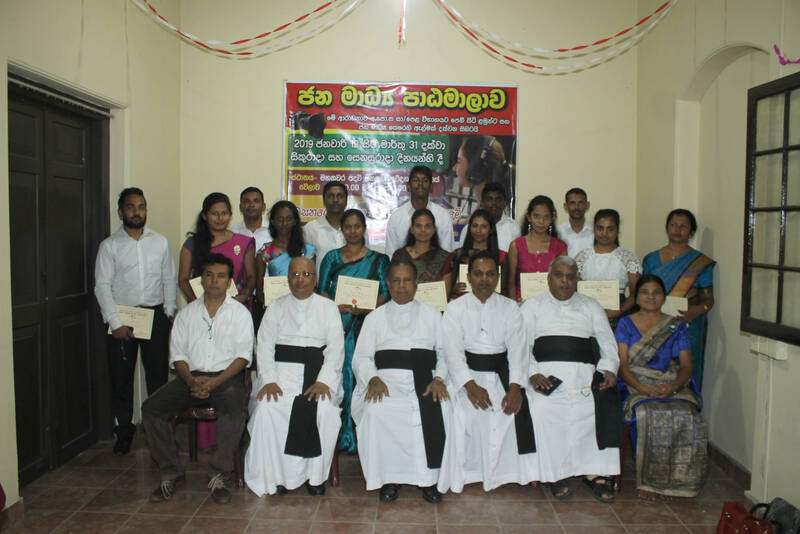 Desmond Perera and his committee and Fr. Newman Peiris who were responsible for the two gatherings of children at Kandy and Cholankande. Let us continue to be personally interested in the progress of each of the children(in the sponsorship scheme) in your parishes in order to ensure that their education progresses without interruption. Periodical evaluations are a must for this purpose. This year, the Season of Lent begins on the 10th of February. The Holy Father specifically mentions in MISERICORDIAE VULTUS, that the Season of Lent in the Great Jubilee Year of Mercy is a privileged moment of conversion for all the baptised faithful. Therefore, every effort should be made to make available to our people opportunities to receive the Sacrament of Reconciliation and engage in other penitential, and special Lenten devotions as well as visits to the Shrines where the Holy Doors are opened. This must be done in an organised way. Already in the Shrines where the Holy Doors are opened, the Parish Priests are displaying posters with various devotions and the times and days when a priest is certainly available to administer the Sacrament of Reconciliation. I will be out of the diocese to attend the meeting of the Pontifical Council of Cor Unum from the 24th February till the 03rd March 2016. The Vicar general will be the Administrator of the Diocese during my absence. Rev. Fr. 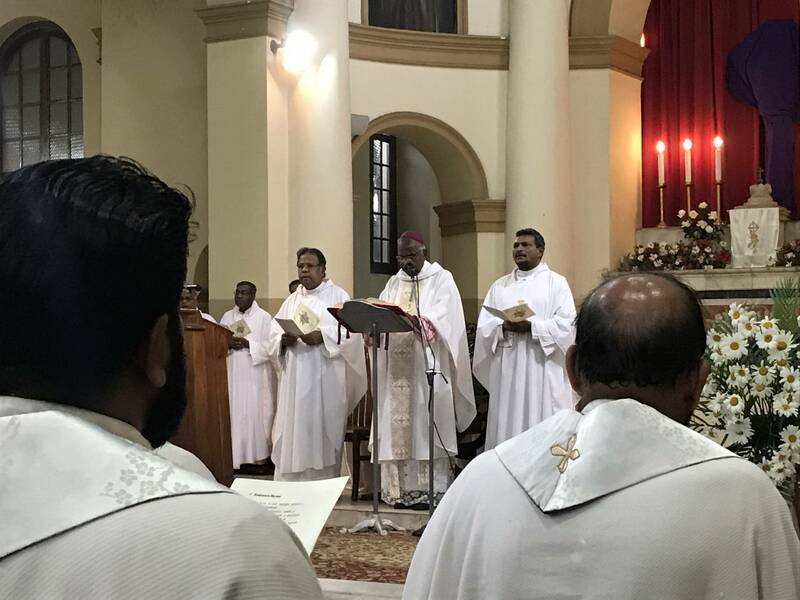 Surendra Pragash as the Coordinating Secretary to the Bishop of Kandy with effect from 20th January 2016.
with effect from 20th January 2016. The Presbyterium of Kandy expresses its deepest sympathies on the demise of Rev. Fr. Vito Perniola S.J. We remember his valuable services rendered to the Church in Sri Lanka with gratitude and prayers. Velu Yogaraja, (a Torture victim) a Political Prisoner, detained under the PTA for 07 years was acquitted by the Hon. Menaka Wijesundara the High Court Judge of Court 01 in Kandy on the 19th January 2016. Velu Yogaraja from Rattwatte Estate lower division, was arrested on 12.08.2008, almost 08 years ago and indictment filed on 14.03.2012. The 01st count was withdrawn on the 06.03.2013. The Indictment was amended on the 10.07.2013. Finally day-to-day trial was started on the 12th of January 2016 before the Kandy High Court Judge Hon. Menaka Wijesundara who insisted trials. On the 12th January, witness No.01, a TID officer, Mr Sunil Yatawera, one of the most notorious torturers, gave evidence. Cross examination started on the 12th the same day by the Human Rights Office legal counsel, Mr S. Padmadakshan. On the 13th January, the cross examination continued the whole day and on the 14th January, the Judge was absent. However on the 18th January, the cross examination followed and was concluded. On the 19th, January, the state counsel wanted to call the witness No. 02, another TID officer, a Torturer, and the Judge asked whether there was any other materials to lead his evidence. The state counsel stated that the accused has given a confession to an ASP but he will not lead that evidence. At this stage, realizing the false evidence, the Judge made an order acquitting the accused, since the State Counsel could not prove that the weapons recovered were in his possession. At the time of recovery of the weapons produced by the TID officers, the weapons were buried in the jungle far away from the residence of the accused and therefore it does not fall within the meaning of possession. Yogaraja who was acquitted on the 18th January, will still have to wait hopefully for another three trials as the TID officers filed 05 cases against him. Yogaraja who was detained by the TID officer sat the Kandy police station for three months was severely tortured almost every night and was forced to make false confessions by signing blank papers, to say that he was involved in Terrorists activities and had weapons in his possession. Mr. Velu Yogaraja (26) who was arrested on the 09th August, 2008 was in Remand Prison for the last 07 years. He was severely tortured on 30th September, 2013 at the prison beaten with high tension electric wire. In the early morning of 30th September 2013, the prison officials took the remand prisoners as usual out of their cells and some of them were prepared to be taken to the courts. Velu Yogaraja was put back in a cell together with another remand prisoner, something which is not usually done. Normally two prisoners are never placed in one cell; it is the custom that it has to be either one single person or a group of three. The new remand prisoner placed in the cell with Velu Yoaraja was mentally ill and in a short while he started using abusive language towards him. The quarrel soon turned into a fist fight. The prison officers who heard them fighting opened the cell and separated them. However, after their breakfast Velu Yogaraja was taken to another cell and severely beaten with a high tension electric wire. He screamed for help but to no avail. This ordeal went on for 15-20 minutes and when the other prison officers discovered that Velu was bleeding he was sent to the prison hospital. The doctor gave him few Panadol pills and Velu requested the authorities that he wanted to be admitted in a general hospital. His request was refused. Velu Yogarasa was then met by HRO lawyer at around 11 a.m. who testifies that Velu told him that he was subjected to severe torture. The lawyer has seen the marks all over his body and that a finger was broken and bleeding. According to Valu, previously in 2011, seven PTA suspects, including himself, were severely tortured by prison officials on June 14 that year inside the prison premises. Velu Yogarasa says that his fundamental rights were denied and that he was tortured while in custody. The Pope App gives you the latest news and information on the Pope as produced by the Vatican‟s own media services and featured on News.va, the official network hub of Vatican communication. The app also allows you to visit the Vatican live through the various webcams located in St. Peter‟s Square and other areas nearby. All media contents are easily shareable and can be saved for later viewing. The language of content can be changed easily within the app to English, Spanish, French, Italian or Portuguese. The Pope App and News.va are services provided by the Pontifical Council for Social Communications (www.pccs.va), in cooperation with the media offices of the Holy See, including, Fides News Agency, L’Osservatore Romano, the Holy See Press Office, the Vatican Television Centre (CTV), Vatican Radio, and the Internet Office of the Holy See. During Mass at Casa Santa Marta, tells faithful to pray for their bishop with their hearts January 22, 2016 Deborah Castellano Lubov Pope and Holy See, Pope’s Morning Homily. This morning during his daily morning Mass at Casa Santa Marta, Pope Francis reminded those gathered of the bishop‟s two required jobs: praying and proclaiming the Gospel, and warned that if these tasks are neglected, God‟s people suffer. According to Vatican Radio, the Pontiff drew inspiration from today‟s Gospel of Mark which recalls Jesus‟ choosing the 12 Apostles, and how, today, the “bishops are pillars of the Church,” called to be witnesses of the Resurrection of Jesus. The second task, he continued, is to be a witness, which means preaching the salvation that the Lord Jesus has brought. I WILL HAVE THE JOY OF OPENING the Holy Door on the Solemnity of the Immaculate Conception. On that day, the Holy Door will become a Door of Mercy through which anyone who enters will experience the love of God who consoles, pardons, and instils hope. On the following Sunday, the Third Sunday of Advent, the Holy Door of…the Basilica of Saint John Lateran will be opened. In the following weeks, the Holy Doors of the other Papal Basilicas will be opened. On the same Sunday, I will announce that in every local church, at the cathedral…or, alternatively, at the co-cathedral or another church of special significance, a Door of Mercy will be opened for the duration of the Holy Year. At the discretion of the local ordinary, a similar door may be opened at any shrine frequented by large groups of pilgrims…. In this Jubilee Year, let us allow God to surprise us. He never tires of casting open the doors of his heart. I am the door of life. guide those who go out. Each day we enter and leave by so many doors without ever noticing…. It is good to stop and give thanks-for all the doors God opens for us…. We reflect on Christ, the door to the Father, who knocks at the doors of our hearts, our homes, and our churches. We live in an age which longs for the presence of God. Our hearts search endlessly for meaning and purpose, never at rest until the grace of God enables us to answer his call. Christ stands at our hearts and knocks. He calls tenderly to us, and as in that upper room where the disciples huddled in fear, he calls out to us: “Do not fear! It is I! And so the first Jubilee door I am called to prepare is the door to my heart. I am called to open my heart to Christ. Like Mary, who bore him deep within her body, Christ gives us the grace to open our hearts to the conversion, unity, and justice of the Kingdom of God. Gone are the days we once knew, when the doors of our homes would open regularly to grandma and grandpa and all the aunts, uncles, and cousins. The doors of our homes don’t seem to swing open quite so easily or as often as they used to. Thus, a second challenge…is to find a way to open the doors of our homes to our families, our friends, and all who need us. The third door of our lives is the door to the Church, the ianua ecclesiae. The Church door is the silent witness to all the moments of our lives. It is at this door that the priest or deacon first welcomes the parents of the new born child and reminds them of the joy that embraced them when first they held that child in their arms. The same Church door looks down years later when that child arrives to be married as the priest receives the couple and greets them in a warm and friendly manner, showing that the Church shares their joy. Finally that door stands witness at the end of life as the body of the deceased Christian is received into the Church at the beginning of the funeral liturgy. It is interesting to note that the antiphon that is sung as the dedication procession passes through these doors for the first time indicates that Christ himself is present in the procession: “Lift high the ancient portals! The King of Glory enters:’ Christ himself is the door to life, and each of the casements of wood or metal which mark our churches or homes are but a reminder of him through whom we enter eternal life. Christ himself told us that he is the door to the Kingdom of Heaven. So Jesus said again, “Amen, amen, I say to you, I am the gate for the sheep. All who came [before me] are thieves and robbers, but the sheep did not listen to them. I am the gate. Whoever enters through me will be saved, and will come in and go out and find pasture. A thief comes only to steal and slaughter and destroy; I came so that they might have life and have it more abundantly” (Jn 10:7-10). Jesus is using the images of two types of sheepfolds here. In the first two verses he describes the kind of “communal sheepfold” which each village would maintain and to which the shepherds might return their flocks each night. The pen was protected by a strong door which could be opened only by the chief shepherd’s key. The second type of sheepfold is described in subsequent verses. Such a containment was provided for those nights when the sheep were to be kept in the fields (as on the night of Jesus’ birth). Such temporary sheepfolds usually consisted of a circle of rocks, with an opening at one end. The shepherd himself would serve as the gate to such sheepfolds, lying across its entrance to sleep. Whether a sheep tried to leave or a wolf tried to enter, they would have to do so by way of the shepherd himself! Christ, then, is not only the door; he is the king who enters and the temple to whom the door leads! In days gone by, the door to heaven was the sky from which God gave us manna (see Ps 78:23), but now Christ is the true bread come down from heaven (cf. Jn 5:51). Jacob saw the gateway to heaven (Gen 28:17) in the earthly shrine at Bethel, but when the martyr, Saint Stephen, gazes at the door to heaven he sees the glory of God and Jesus (Acts 7:55). Christ not only invites us to enter the Kingdom of Heaven through him, he even leaves the keys to his Apostles, assuring them that whatever you bind on earth shall be bound in heaven; and whatever you loose on earth shall be loosed in heaven (Mt 16:19). Unlike the foolish virgins whose lamps were not trimmed in time for the wedding banquet, those who repent of their sins and receive Christ’s forgiveness through the Church will not find the door barred when the bridegroom returns (see Mt 25:10).  He knew that once His work was finished, He was going to the Father and would be glorified with the Father. John 17:1-5, 13:1-4, 16:5. Only for today, I will seek to live the livelong day positively without wishing to solve the problems of my life all at once. Only for today, I will dress modestly; I will not raise my voice; I will be courteous in my behaviour; I will not criticize anyone; I will not claim to improve or to discipline anyone except myself. Only for today, I will be happy in the certainty that I was created to be happy, not only in the other world but also in this one. Only for today, I will adapt to circumstances, without requiring all circumstances to be adapted to my own wishes. Only for today, I will devote ten minutes to some good reading, for good reading is necessary to the life of the soul. Only for today, I will do one good deed and not tell anyone about it. Only for today, I will do at least one thing I do not like doing; and if my feelings are hurt, I will make sure that no one notices. Only for today, I will make a plan for myself: I may not follow it to the letter, but I will make it. And I will be on guard against two evils: hastiness and indecision. Only for today, I will firmly believe, despite appearances, that the good providence of God cares for me as no one else who exists in this world. Only for today, I will have no fears. In particular, I will not be afraid to enjoy what is beautiful and to believe in goodness. “I desire mercy, and not sacrifice” (Mt 9:13). In the Bull of Indiction of the Extraordinary Jubilee of Mercy, I asked that “the season of Lent in this Jubilee Year be lived more intensely as a privileged moment to celebrate and experience God’s mercy” (Misericordiae Vultus, 17). By calling for an attentive listening to the word of God and encouraging the initiative “24 Hours for the Lord”, I sought to stress the primacy of prayerful listening to God’s word, especially his prophetic word. The mercy of God is a proclamation made to the world, a proclamation which each Christian is called to experience at first hand. For this reason, during the season of Lent I will send out Missionaries of Mercy as a concrete sign to every one of God’s closeness and forgiveness. After receiving the Good News told to her by the Archangel Gabriel, Mary, in her Magnificat, prophetically sings of the mercy whereby God chose her. The Virgin of Nazareth, betrothed to Joseph, thus becomes the perfect icon of the Church which evangelizes, for she was, and continues to be, evangelized by the Holy Spirit, who made her virginal womb fruitful. In the prophetic tradition, mercy is strictly related – even on the etymological level – to the maternal womb (rahamim) and to a generous, faithful and compassionate goodness (hesed) shown within marriage and family relationships. The mystery of divine mercy is revealed in the history of the covenant between God and his people Israel. God shows himself ever rich in mercy, ever ready to treat his people with deep tenderness and compassion, especially at those tragic moments when infidelity ruptures the bond of the covenant, which then needs to be ratified more firmly in justice and truth. Here is a true love story, in which God plays the role of the betrayed father and husband, while Israel plays the unfaithful child and bride. These domestic images – as in the case of Hosea (cf. Hos 1-2) – show to what extent God wishes to bind himself to his people. This love story culminates in the incarnation of God’s Son. In Christ, the Father pours forth his boundless mercy even to making him “mercy incarnate” (Misericordiae Vultus, 8). As a man, Jesus of Nazareth is a true son of Israel; he embodies that perfect hearing required of every Jew by the Shema, which today too is the heart of God’s covenant with Israel: “Hear, O Israel: The Lord our God is one Lord; and you shall love the Lord your God with all your heart, and with all your soul, and with all your might” (Dt 6:4-5). As the Son of God, he is the Bridegroom who does everything to win over the love of his bride, to whom he is bound by an unconditional love which becomes visible in the eternal wedding feast. This is the very heart of the apostolic kerygma, in which divine mercy holds a central and fundamental place. It is “the beauty of the saving love of God made manifest in Jesus Christ who died and rose from the dead” (Evangelii Gaudium, 36), that first proclamation which “we must hear again and again in different ways, the one which we must announce one way or another throughout the process of catechesis, at every level and moment” (ibid., 164). Mercy “expresses God’s way of reaching out to the sinner, offering him a new chance to look at himself, convert, and believe” (Misericordiae Vultus, 21), thus restoring his relationship with him. In Jesus crucified, God shows his desire to draw near to sinners, however far they may have strayed from him. In this way he hopes to soften the hardened heart of his Bride. neighbours in body and spirit: by feeding, visiting, comforting and instructing them. On such things will we be judged? For this reason, I expressed my hope that “the Christian people may reflect on the corporal and spiritual works of mercy; this will be a way to reawaken our conscience, too often grown dull in the face of poverty, and to enter more deeply into the heart of the Gospel where the poor have a special experience of God’s mercy” (ibid., 15). For in the poor, the flesh of Christ “becomes visible in the flesh of the tortured, the crushed, the scourged, the malnourished, and the exiled… to be acknowledged, touched, and cared for by us” (ibid.). It is the unprecedented and scandalous mystery of the extension in time of the suffering of the Innocent Lamb, the burning bush of gratuitous love. Before this love, we can, like Moses, take off our sandals (cf. Ex 3:5), especially when the poor are our brothers or sisters in Christ who are suffering for their faith. In the light of this love, which is strong as death (cf. Song 8:6), the real poor are revealed as those who refuse to see themselves as such. They consider themselves rich, but they are actually the poorest of the poor. This is because they are slaves to sin, which leads them to use wealth and power not for the service of God and others, but to stifle within their hearts the profound sense that they too are only poor beggars. The greater their power and wealth, the more this blindness and deception can grow. It can even reach the point of being blind to Lazarus begging at their doorstep (cf. Lk 16:20-21). Lazarus, the poor man, is a figure of Christ, who through the poor pleads for our conversion. As such, he represents the possibility of conversion which God offers us and which we may well fail to see. Such blindness is often accompanied by the proud illusion of our own omnipotence, which reflects in a sinister way the diabolical “you will be like God” (Gen 3:5) which is the root of all sin. This illusion can likewise take social and political forms, as shown by the totalitarian systems of the twentieth century, and, in our own day, by the ideologies of monopolizing thought and techno science, which would make God irrelevant and reduce man to raw material to be exploited. This illusion can also be seen in the sinful structures linked to a model of false development based on the idolatry of money, which leads to lack of concern for the fate of the poor on the part of wealthier individuals and societies; they close their doors, refusing even to see the poor. For all of us, then, the season of Lent in this Jubilee Year is a favourable time to overcome our existential alienation by listening to God’s word and by practising the works of mercy. In the corporal works of mercy we touch the flesh of Christ in our brothers and sisters who need to be fed, clothed, sheltered, visited; in the spiritual works of mercy – counsel, instruction, forgiveness, admonishment and prayer – we touch more directly our own sinfulness. The corporal and spiritual works of mercy must never be separated. By touching the flesh of the crucified Jesus in the suffering, sinners can receive the gift of realizing that they too are poor and in need. By taking this path, the “proud”, the “powerful” and the “wealthy” spoken of in the Magnificat can also be embraced and undeservedly loved by the crucified Lord who died and rose for them. This love alone is the answer to that yearning for infinite happiness and love that we think we can satisfy with the idols of knowledge, power and riches. Yet the danger always remains that by a constant refusal to open the doors of their hearts to Christ who knocks on them in the poor, the proud, rich and powerful will end up condemning themselves and plunging into the eternal abyss of solitude which is Hell. The pointed words of Abraham apply to them and to all of us: “They have Moses and the prophets; let them hear them” (Lk 16:29). Such attentive listening will best prepare us to celebrate the final victory over sin and death of the Bridegroom, now risen, who desires to purify his Betrothed in expectation of his coming. Let us not waste this season of Lent, so favourable a time for conversion! We ask this through the maternal intercession of the Virgin Mary, who, encountering the greatness of God’s mercy freely bestowed upon her, was the first to acknowledge her lowliness (cf. Lk 1:48) and to call herself the Lord’s humble servant (cf. Lk 1:38).